Monitor and report stock levels, costs and averages. View inventory levels by location, category or overall. Product history shows when items were received or sold. Create purchase orders and email directly to vendors. Maintain a database of customers and suppliers. Set low-level warnings so you know when to reorder. Update item quantities when orders are received. Import current inventory with a .csv file. Scan in barcodes to add new items. Add notes, URLs and photos to item descriptions. Group items into categories for organized stock control. Set sales units for items sold by weight or in bundles. Integrates with other business programs to maintain inventory data across all aspects of your business. Transfer stock between locations. Web access allows users in different locations to log in. Assign appropriate access levels to different users. Mobile access to the program through the web interface . Manage multiple businesses simultaneously. 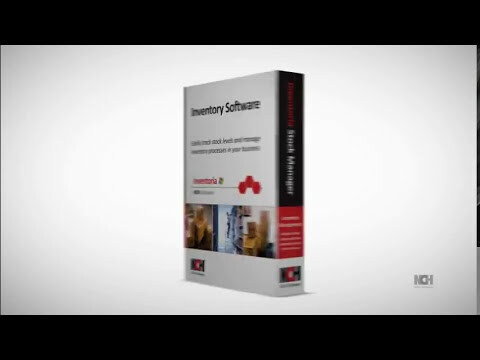 Inventoria is dedicated inventory management software for small- to medium-sized businesses. Track stock levels across categories or by location, pull reports for stock levels, and manage your suppliers and customers all with one easy-to-use program from NCH Software. Q. Can I put a password on Inventoria? The main version of Inventoria is not password protected, however, you can set it up for Web Access with password protection. Q. Can I sync data between Express Accounts, Express Invoice, Copper and Inventoria? Yes, using Inventoria as the server program, you can update Inventoria's inventory levels from other programs. Go to the Other tab of Options (Preferences on a Mac), click the "Advanced Settings" button, check the "Allow Express Invoice, Express Accounts or Copper to synchronize with Inventoria" checkbox to turn this option on. Q. Why is the email address grayed out when you go to change it in options ? You cannot edit a user's email address. If you want to change it, you will need to delete the user and then enter them again with the new email address. Q. Will Inventoria work on 64 bit computers? Yes, the current version of Inventoria will work on any 64 bit Windows 10, 8, 7, or Vista computers.